Mila: Grafik asked us to write about any logo that we like. 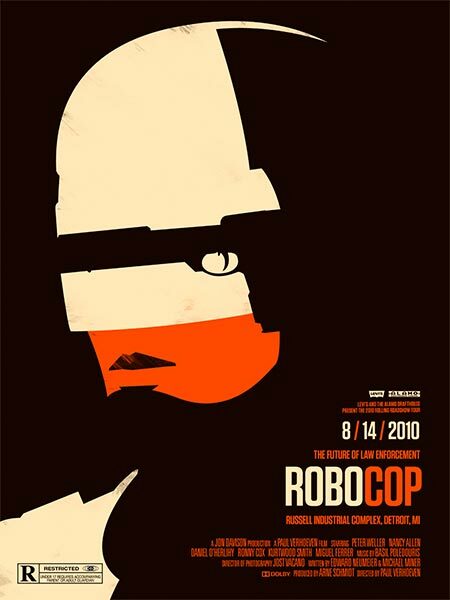 We already decided to talk about the OCP logo from the original RoboCop movie. OCP stands for Omni Consumer Products, which is the megacorporation that is also running the Detroit police department. Egon: I still don't really know why we picked that particular logo. M: Hmm yeah, maybe we can think about an excuse later. So here's a print out. As you can see here, the designer didn't even bother getting the letters in the right order. Nor making them recognisable. Franz: In medieval architecture the octagon was seen as a representation of god-like perfection. Looking at the somewhat lazy execution of the logo this seems kind of ironic, doesn't it. But what is striking regarding the form-feeling of the OCP octagon? It looks like a fortress, it's aggressive, and self-centered as well as sealing-off and protective. Now the question is: is this logo well designed or not? Does the brutalist style build a harmony with the realm of RoboCop? Ziggy: Can I say something? I think the logo gives us a dark future vision of graphic design. I mean a corporation like OCP doesn't really need a well-designed CI since they are the only player in the market anyway. The logo doesn't have to appeal to the customer. I also believe OCP have an in-house cyborg taking care of all their CI and advertising. He's fast and cheap. He doesn't ask questions because he's just following his prime directives. E: That's the future. We're all going to melt into our Macs. We'll look like Björk in that video where she was making love to her double. We'll be shiny white design zombies producing crude logos for one and the same company.